If you are trying to find the best camping tips for beginners, it is not easy to find camping hacks that help you as a beginner. Many reviews website and Amazon won’t offer you a definite recommendation! They will repeatedly try to advertise you the most significant and most costly tent goods, not the effective or most suitable. If you have confusion choosing a tent then how to choose a tent article for you. It might help you as a beginner. When you are sure to go camping for the first time in your life, some crucial tips should be known very well. You need to have proper Information about everything regarding camping before you go for a tour. This article is the appropriate way to have a piece of relevant information and guideline. So, are you ready to know about tent camping tips for beginners? The basic concept of camping is right for your free time. It is necessary for any outside leisure activity that you take sufficient preparation for it. The development of camping listing is the first thing that you need to do. 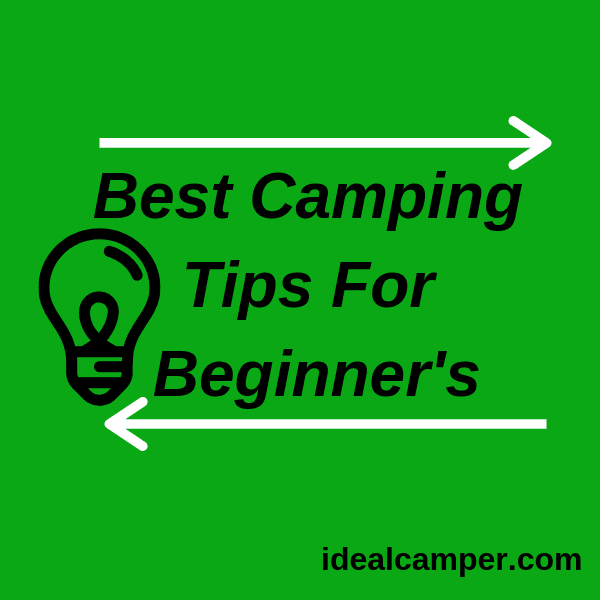 This is the first tips for beginner camper. 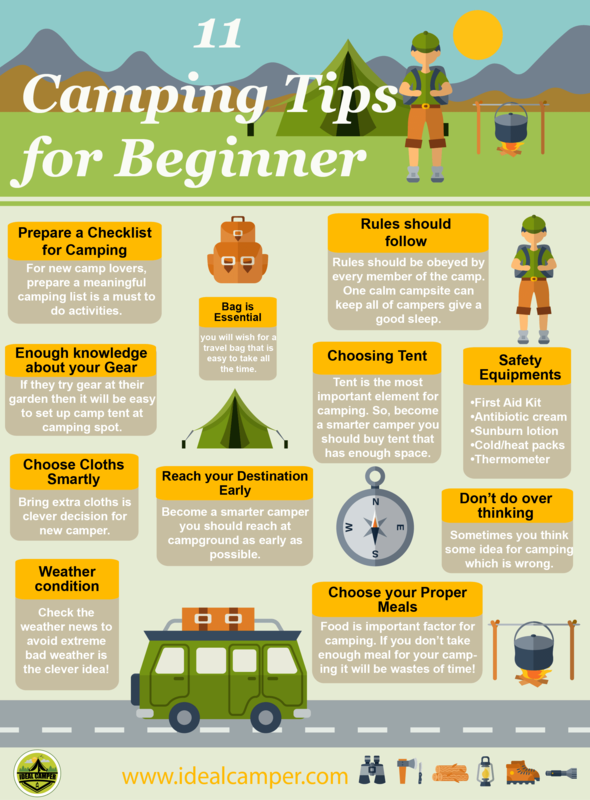 The Image Is self-described about the camping tips for beginners. It’s Might be helpful for the new people who want to go camping. Don’t forget to share this awesome infographic if you find anything that help you. Let’s discuss the top 10 best tent camping tips for beginners. No one plans to be unsuccessful, but a lot of us fail to plan! If you believe that your memory is well enough to remember everything to take for camping. Then you are wrong! You will miss some important things that are necessary for the ideal camping if you do not have a proper camping list. For the new camping lovers, prepare a meaningful camping list is a must to do activities. However, one who has been taking part in hundreds of camping on different occasion also requires some preparations. A camping list ensures that you have got all the essential camping materials in your bag. Camping list not only means that will listing your items, but also the list of those things that you must have to carry for a hassle-free camping experience. Most of the campers made a mistake when they go camping the first time in their life! They couldn’t even try their camping gear before they come to the camp. So, they face trouble to set up their tent and other stuff. If they decide these things at their lawn or garden within their residence, then it will be very much easy to set up a camp tent at the camping spot. Before going to camp, you should try your sleeping bag at least one time in your living room. You need to check if it works well and become comfortable for further use. 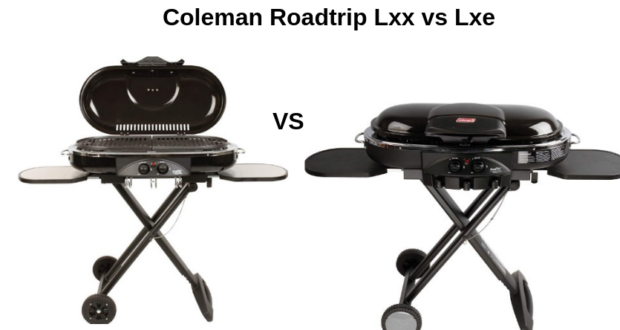 You should also check out the stoves and lights to ensure that they properly operate in the camping time. 3. Don’t Forget that it is all about the Comfort! The tent is the most important factor for your camping. If the tent is not comfortable and useful during the camp time it will be totally messed up your most wanted camping. As a result, the tent space is a big factor for beginner camper. New campers should pay money for tents with having enough space. It is also important that the tent could fit in your carrying vehicles like car, bus or van etc. If you have two or more members in your family or friends while you are in the camping, definitely you should pay money for a tent which has the capacity of at least 6 persons in it. So, turning into a smarter camper, you always should buy a tent that has enough space. The beginner will most likely to be new with camp rules and facilities. If you’ve not participated in any camping before, then how are you actually know all of these? So, for the beginner reaching on the camping spot early is very important. This is helpful for you to learn the camp rules. In the early morning, you should make your tent that could have a good impact on camp neighbors. It is much painless to do something when you are able to see what you are doing. So, become a smarter camper you should reach at the campground as early as possible. Food is an important factor for your camping experience. If you do not take a sufficient amount of meal for your camping it will be wastes of time! For the beginner, it is the most important thing to make a proper meal planning. New camper sometimes forgets this important task. Firstly you make a good plan for the food item and according to the plan acquire those items from the market. The suitable time for shopping the grocery item is the previous day of your camping. It helps to keep the food fresh during camping. In your meal plan, you should buy food that is energy gaining. So, become a smarter camper you should make your meal plan for enjoyable camping. The beginner may not understand that there is no actual space to yourself in a campground. The rules should be obeyed by every member of the camp. One calm and comfortable camp can keep all of the campers give good sleep. Observing quiet hours is necessary during camping. If every camp member follows the camp rules, the camp will be calm and quiet. All the member of the camping should respect the other campers and no need to interfere with space they have chosen, and should not go to other camps to find a little more place. Be a good camper, you should maintain camp rules strictly and properly. Camping is a completely outdoor activity. So when you go outside of your home some necessary things should be very important. When it is about choosing the cloth for camping, the beginner must need to know some tips. The beginner campers habitually overlook the point to bring sufficient clothes in camp. Keep in mind that there is no laundry services at the camping spot. The environment should be kept in mind also for choosing clothes. You must take the dress for every weather conditions if you have space in your travel bag. For the cold weather condition, warm clothes are necessary, for the rainy weather raincoat is a must and for the warm weather, the comfortable dress should be necessary to carry. Bring extra clothes is a clever decision for a new camper. To spend some relax time we love to go camping. If you are not concern about the weather condition it will be great digester! For the beginner campers, this mistake is common and must be avoidable. It is a bad decision for camping when you know there is even little chance of rain or snowfall. There is not anything more painful than sitting in your tent for three or more days while rain strikes your tent and the rainstorm keeps laying it down on top of you. So, better still you need to check the weather news to avoid extreme bad weather before going to the camp. Sometimes you think some ideas for camping which are wrong. There will perhaps an all-purpose table at your camp, so you don’t require any additional chairs or tables. Keep in mind that does not over pack your bag. Bringing a sound box or Bluetooth device for the listening song is a bad idea for camping because it makes the camp noisy at that point in time. You should use headphone for enjoying the music without disturbing other camper is always a good practice. If you do not camp regularly or if you’re planning for a large camp, then it’s often better to go for something light and multipurpose (and perhaps carry-on range), as you will wish for a travel bag that is easy to take all the time. In this point, we will share with you what we think are a number of the 5 best travel backpacks for camping anywhere. Hope these tips are helpful for the beginner camper. If you are following the things for your first time experience of camp, it will be my pleasure! And if you are still in doubt, please look through, our site is only talking about the best tents reviews! So you will discover so many things for you. Thank you for reading for such a long time, please don’t forget to use the comment box below if you have any question or comment or mentions us if we ignore some point to share regarding tent camping tips for beginners. Wish you have a nice Camping!